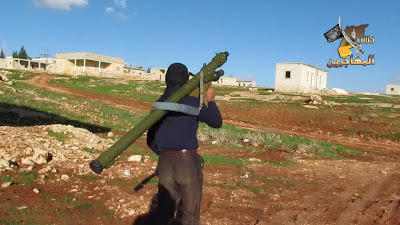 As regular visitors to the blog will know in recent weeks there's been a number of videos surfacing that showed partial SA-16 MANPADS in the possession of the Syrian opposition (see here, here, and here for examples). 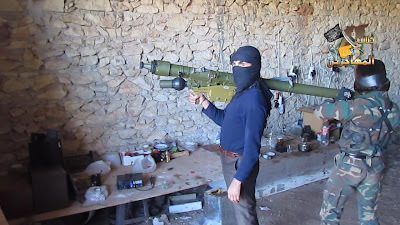 MANPADS (Man Portable Air Defense Systems) are shoulder mounted surface to air missile systems, with a number of examples of the more dated SA-7 reportedly in use by the Syrian opposition in recent months. Previous examples of SA-16 sightings in Syria have shown incomplete systems, missing the grip-stock component, which along with the missile tube and battery pack makes up the complete MANPADS system. Missile tubes come preloaded, and battery packs generally have enough charge for one use, with the grip-stock being the only reusable part. This means having a thousand missile tubes and battery packs without a grip-stock is worthless, but one grip-stock would make all of those missile tubes and battery packs usable. As far as I am aware this is the first example of a complete SA-16 MANPADS system in the possession of the Syrian opposition, and would be a vast improvement on the SA-7 systems seen so far. The main question is how many missiles and battery packs do they have access to? 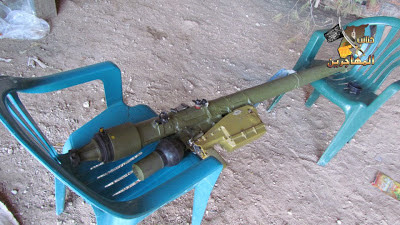 Update December 18th Peter Bouckaert of Human Rights Watch has just reminded me there was one sighting of a complete SA-16 system before.